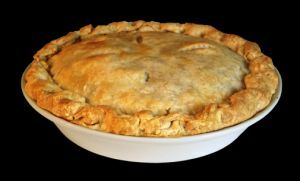 Hot Milk and Water Pastry is an easy pie crust recipe using a hot mixture for two pie crusts. Sieve the flour and salt into a warm basin. Put milk, water, and shortening on to boil. Pour it into the middle of the flour and mix well with wooden spoon. Knead with the hand until smooth. Form two balls and roll out each for top and bottom of pie plate.